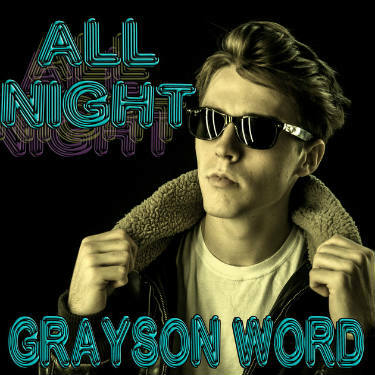 All Night is a follow up single to an EP released earlier this year (at only age 17) by Grayson Word, a “soul/pop singer & multi-instrumentalist based in Nashville.” The verses in All Night delight with a loungy, funky pop sort of quality, but where the track really shines is the chorus. Out of nowhere, Word’s voice casually reaches unexpected highs with considerable ease. This dynamic quality is reminiscent of songs like Billy Joel’s The Stranger. It’s evident from listening to even one Grayson Word track is that this kid is no poser. There are tons of aspiring young pop stars out there with recordings which are gummed up with autotune and horrible effects processing to mask deficiencies in skill. All Night doesn’t have any of that and Grayson’s musical chops are confidently displayed in full force. These recordings cut through the BS that infects much of contemporary pop music. On top of all that, this guy is only a teenager and probably hasn’t even reached his full potential yet. The only thing standing in the way of All Night being played in nearly every department store is a lack of industry connections. Hopefully, that will change as the “Word” gets out.